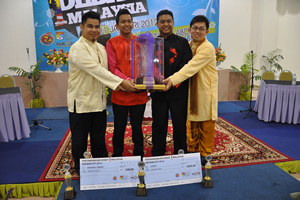 BANGI, 1 Feb. 2012 – The University of Malaya debating team was crowned champion in the 1 Malaysia Debating competition beating the University Malaysia Terengganu team in the final held at the Tun Abdullah Salleh Hall in the National University of Malaysia (UKM) campus here yesterday. 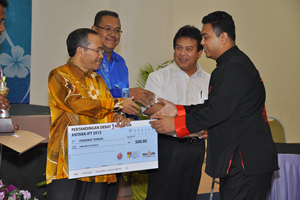 Its debator Muhammad Azzairi, a fourth year law student was judged the best debator. The team won the challenge trophy, another trophy, souvenirs, certificates and RM5000 cash with UMT team taking back a trophy, souvenirs, certificates and RM3000 cash. The UKM team managed to reach the quarter finals but were beaten by the Multi Media University team for a place in the semi-finals. A total of 21 public institutions of higher learning (IPTA) took part in the debates beginning from last week with each team having to get through six rounds to get to the quarter finals. 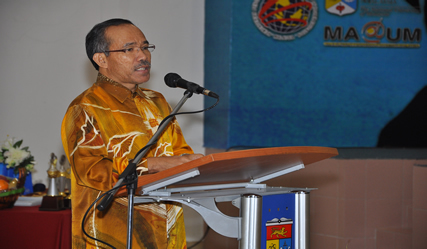 Among those attending the finals were Secretary General of the Ministry of Higher Education, Datuk Abdul Rahim bin Md. Noor; Deputy Vice Chancellor (Students and Alumni Affairs) UKM, Prof Ir Dr Othman A Karim; Deputy Vice Chancellor (Students Affairs) UM, Prof Datuk Dr Rohana Yusof, Deputy Vice Chancellor (Students Affairs) UMT, Prof Dr Yahya Ibrahim and Secretary of the Intervarsity Debating Council, Dr Akmal Khuzairy Abd Rahman. This was the second time in succession that UKM had hosted the debating competition since its inception last year. Prof Othman said even though the UKM team was knocked out at the quarter finals stage, UKM was proud to be the host again. It has also been encouraging its students to be active in debates. UKM had in fact pioneered the resumption of the speakers’ corner in the campus since 2010 to enable its students to hone their skills in public speaking after almost three decades of its banning in all the IPTS.